Workshop participants discuss their community’s future. Most of Atmore is divided into two noncontiguous pieces of land. The first, bordering the Florida panhandle, contains Atmore’s historic downtown and surrounding neighborhoods. This downtown is the heart of the community and is just beginning to see some revitalization and renewed interest as several new small businesses open. The second half of the city’s land, known locally as Rivercane, is about five miles north around I-65; the land was annexed over the last 20 years to build an industrial park. 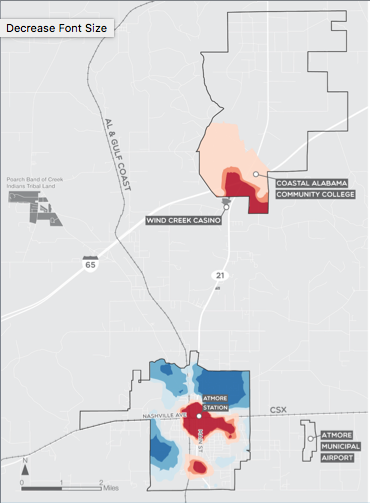 Today, Rivercane is home to the local community college and the Wind Creek Casino—run by the Poarch Band of Creek Indians, technically on reservation land just outside of city limits—which attracts visitors from Pensacola, FL, Mobile, AL, and beyond. The success of Atmore and the Poarch Band of Creek Indians is intertwined. The Tribe runs several industrial businesses in Rivercane which are among Atmore’s major employers and the Alabama Department of Corrections has two facilities in Rivercane as well. Local leaders are also considering relocating their community hospital from downtown to Rivercane and are contemplating whether to annex and develop additional land along the state road that connects the two parts of town. Despite its investment in Rivercane, the tribal government recognizes the importance of creating a sense of place in downtown Atmore where residents, visitors, and employees will want to spend time (and return to in the future). 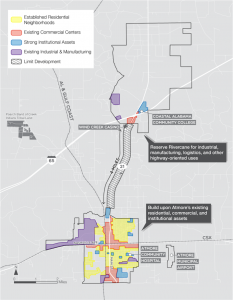 Between the potential hospital relocation and annexing more land, Atmore is in the midst of discussions about how much—and what type of—investment to make in Rivercane. All of these questions led Atmore to partner with Smart Growth America to hold a Planning for Economic and Fiscal Health workshop to put the city in the best position for long-term economic growth. Over a two day visit, our experts toured the city and tribal community, interviewed groups of local stakeholders, offered a public presentation, and led an invite-only all day workshop. 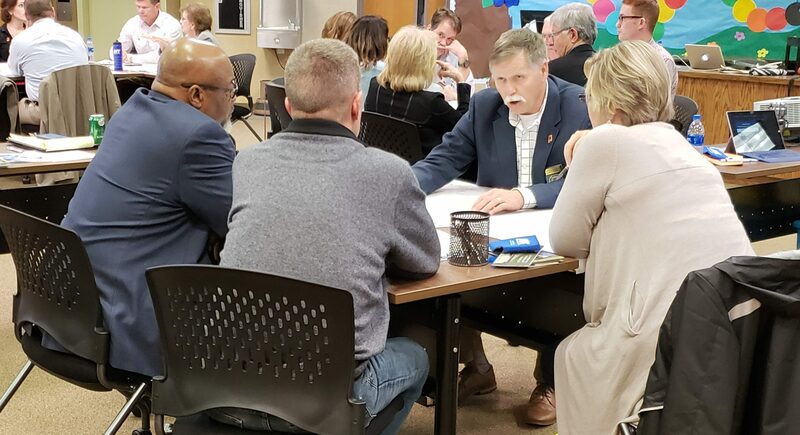 At the workshop, our experts presented current economic and demographic trends that have put cities like Atmore in fierce competition with their peers to attract Millennials and Baby Boomers. Keeping this in mind, attendees at the workshop broke into small groups to discuss specific actions that Atmore should take in either downtown or Rivercane. We also prepared a hotspot analysis for Atmore to show workshop attendees where high- and low-value properties are clustered within the city. The analysis (left) shows that the most valuable properties in the city—averaging $12,000 per acre—are located downtown. By contrast, the value of an acre in Rivercane is only $1,200. The hotspots in downtown also contain nearly three times as much total value as those in Rivercane, $19.2 million vs. $6.6 million). Based on the interviews, the workshop, and our independent analyses, we recommended that Atmore build upon the downtown’s existing residential, commercial, and institutional assets, reserving Rivercane for those types of land uses—such as heavy industrial, which fits with the original intent for the area—that don’t make great neighbors. Downtown has a number of buildings ripe for redevelopment, including a historic movie theater. By preserving and redeveloping vacant buildings and focusing on downtown placemaking, Atmore can create a healthy heart that will pay dividends into the future. Fitting with that recommendation, keeping the hospital in its current location or moving to another downtown-adjacent property would be a boon for the city’s economic prosperity over the longer term. The hospital is a place of treatment, a center of employment, and a convening space for other community activities. Visitors and employees patronize nearby businesses, creating a wake of economic activity that would be lost by relocating the hospital to the sparsely populated Rivercane. Similarly, further development of land between Rivercane and downtown would dilute the impact of investments downtown. Atmore knows it needs to continually pursue growth and redevelopment. By creating a downtown that attracts residents and visitors alike to dine and shop, it can do that in a way that protects both its economic and fiscal health. The workshop was funded at no cost to Atmore by a grant that Smart Growth America received through USDA’s Rural Community Development Initiative program. To learn more about Smart Growth America’s work under this program, please visit this page. Interested in bringing Smart Growth America’s experts to your community? For more information on our technical assistance program and how your community can request assistance from us on a variety of land use, development and transportation challenges, please visit this page.